Kara no Kyoukai (Kara no Kyoukai) is a long adventure novel authored by Kinoko Nasu, the scenario writer for Type-Moon, which became famous through its games Tsukihime and Fate/stay night. The novel was first published at Comiket 61 in 2001, and was later re-released by Kodansha in 2004. 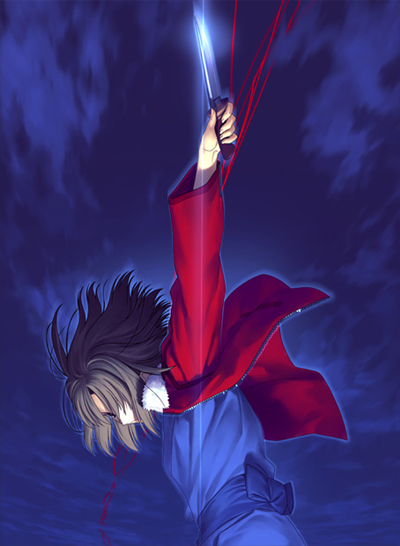 At the end of 2006, Type-Moon announced that Kara no Kyoukai will be adapted into a 7-part movie series by ufotable under the title Kara no Kyoukai ~Garden of Sinners~. As Kara no Kyoukai is being fully animated for the big screen, Karzu, an impassioned fan of Kinoko Nasu, got to talk to him about this and that. 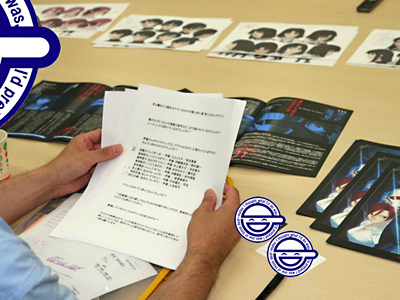 The 2-part interview was published on Akiba Blog in September. Below is the English version of Part 1 of the interview. 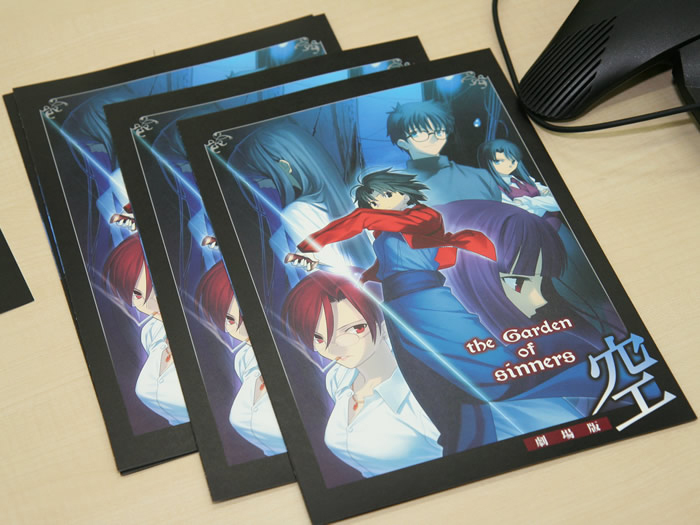 Master Kinoko Nasu is the scenario writer for TYPE-MOON, which made the "moe" business world globally famous through its games Tsukihime and Fate/stay night. Kara no Kyoukai is a long adventure novel penned by Master Kinoko in his early days. He began releasing it on the Web in 1998, and, three years later, he self-published it. In 2004, after being corrected and retouched by Kodansha, it was republished in a commercial edition as Kara no Kyoukai - First Half and Kara no Kyoukai - Second Half, becoming a big hit. Now, Kara no Kyoukai has been fully animated for the big screen (official site). As a result, Master Kinoko Nasu's impassioned fan, Karzu, got to talk to him about several things! First of all, could you tell me what exactly happened to get this work into the theaters? Kinoko Nasu: Certain people have been wanting to make Kara no Kyoukai into an anime for a while now, but it isn't a story which really lends itself to being filmed, so I always turned them down. I thought, since the story is like a prose poem, if it ran as a TV anime, the audience's consciousness would feel scattered; it would be hard to understand, and would probably stress them out. When they said, "Well then, what about a movie?" I thought, "Huh! I see. Before the movie begins, there's the physical activity of actually getting to the theater, so the audience's power of concentration might be heightened..." And just as I was about to let myself be persuaded by that, I thought about it calmly and realized that it would still be hard after all (laughs). I calmed down, and the discussion ended there. After that, I thought there'd probably never be a Kara no Kyoukai anime, but one year ago, I heard from Kodansha's Oota-san. (Oota Katsushi from Kodansha. As an editor, he started the literary magazine Faust, and is presently the editor-in-chief of the new start-up label, Kodansha BOX. This label also has Nasu-san's latest work, DDD.) Oota-san's offer was: "I was thinking of teaming up with Aniplex and ufotable and making Kara no Kyoukai into a consecutive seven-movie release; what do you think?" It was such an off-the-wall idea that I got caught up in the enthusiasm; the offer was so awesome that turning it down seemed rude, so I agreed readily. Of TYPE-MOON's works, Shingetsutan Tsukihime (hereafter Tsukihime) and Fate/stay night (hereafter Fate) have been animated, so I didn't think a theatrical version alone would really make the users all that happy at this late date. But a consecutive seven-movie release – that's incredibly exciting both for the viewers and for the production side, so it seemed like it might be worth doing. Nasu: One could also call it "reckless" (laughs). And it isn't embarrassing to have one of your older works dug up? Nasu: Of course it is, yes. Kara no Kyoukai was something I wrote when I was at my most inexperienced; now that, after ten years, it's risen from the grave like this -well, it's not exactly "The Monkey's Paw" (*1), but there's still sort of an "I should've stopped it" feeling. You've got to understand, though, that's only as far as the original book goes; when I see the finished PVs and how much energy the staff is putting into this, it isn't Kara no Kyoukai, but Theatrical Edition: Kara no Kyoukai that I feel I'll really be able to be proud of. Did you ever think of using this animated version as an opportunity to take the parts of the original novel which you always thought you would have liked to fix and improving those, altering the original elements? Nasu: In Kara no Kyoukai, the first story, "Overlooking View" (俯瞰風景) is the clumsiest. I've always thought I wanted to do something about it, and I told a staff member, "If we're making this into a movie, I'm going to rewrite the first story; please let me do that." But he said, enthusiastically, "No, I want to work with it the way it is. I want to animate this!" Then, when I read the finished script, they'd cut out over half of the unnecessary excess fat and had turned out something more interesting as a story, so I thought, "If it's like this, they don't need me to rewrite it." The elaborate setting of Kara no Kyoukai is one of its distinguishing characteristics; there's a fear that, even if it's filmed as-is, there won't be enough explanation. How are they resolving that? Nasu: By cutting out the bits that get in the way. Then by expressing what they can through the pictures, the beautiful background art and the atmosphere of the film, and keeping in words only the devices that absolutely have to be there. However, I think there are still places left which you won't understand after just one viewing. You can probably understand those better by watching it through again, or by reading the book. How well do you think people first coming into contact with Kara no Kyoukai will follow it? Nasu: It may not be possible after just the first story. We're doing it in its original chronological order, so even if the first and second stories are well made, they'll only have a superficial understanding of the whole story through them; when they've watched all seven stories through, I think they'll finally be at the point where they can understand it without reading the original. There have been all sorts of discussion about ways to get people to come to the theater seven times. (*2) Could you tell me anything - just a hint - about what those methods might be? (Laughs) But that method - it wouldn't simply be to leave things hanging at the end or something similar, would it? Nasu: Of course we're thinking that, too, but each story is basically complete unto itself, so... We want the viewers to feel refreshed at the conclusion part of the "introduction, development, turn and conclusion" bit (*4), leave a little left hanging at the end via production, and finally, we'd like to have them leave the theater feeling glad they came. Nasu: As I said a little while ago, the staff said that they wanted to work with the original novel as-is, that they ultimately wanted the focal point to be on producing that feeling of untraceable bewilderment and the sensation of an imbalance that's become its own entity, so it was decided to release the work in its original order. If these were going to be coming out one every six months, I would absolutely have stopped them, but fortunately, they're slated to be put out one every month for about seven months, so I think we'll probably be able to get by with having the story all over the place. I think this is something we can do only because there's not much time between releases. About those seven releases - the lengths of each of the chapters vary pretty widely; will the movies all be roughly the same length? Nasu: They won't, no. If it were a TV anime, the episodes would have a set length of twenty minutes each; however - and this is one of the best things about a theatrical release - the lengths of the movies are varied. Nasu: The cute, moe-type character is the boy Shiki (織), and the prickly-seeming one is the girl Shiki (式). The cuteness of the boy Shiki in the second chapter is absolutely incredible (laughs). *1: The Monkey's Paw: At one point in this story, an older couple wishes that their dead son was alive again, then - when, presumably, his zombie shows up - must wish him back in his grave. See Wikipedia article for details. *2: In Japan, regular movie tickets run about $18 each. *4: Classic rules for composing a Chinese poem, which have since taken on a general meaning of summarizing the basics of good storytelling. Kara no Kyoukai Anime to be Announced?